Post now: to immediately post. Schedule: to schedule a date for posting. Custom Posting: to schedule the same post on different dates. Access your Social Media → Queue and click on Compose. Choose your social profiles to post to. Add your link. This is important if you want to track the click engagement from the different social media channels. Add your media file, you can either upload a new file or access your saved media inside the File Manager. You can also use the Giphy tab or Open Source Image/video search from Pixabay to get access to thousands of media options for your posts.. 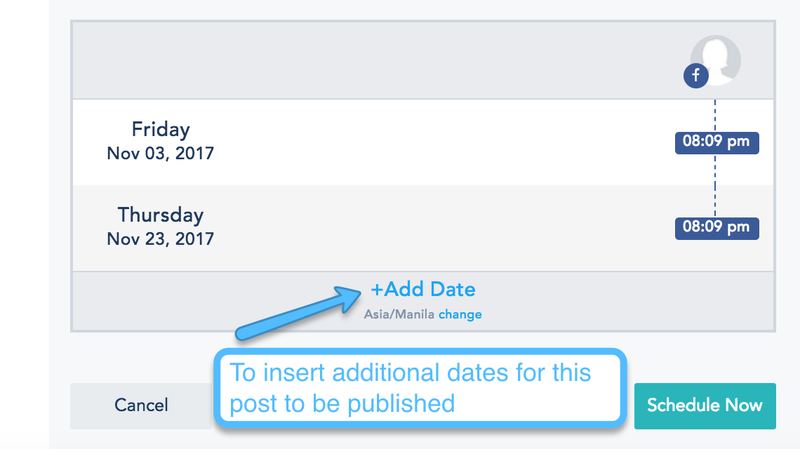 Confirm whether you’d like to immediately publish your post by clicking Post Now, Schedule it to post on one specific date, or schedule it to post on a specific custom dates (by choosing Custom Posting). If you choose Schedule, you will need to choose the date and time. If you choose Custom Posting, you will need to specify the dates on which the post should be published. Once your post has been scheduled successfully, you will see it on your social calendar page.